The Lexington Training Band is composed of over two dozen members of the Lexington Minute Men and is dedicated to accurately portraying the men of the Lexington militia as they appeared on April 18th and 19th, 1775. Despite popular belief, the Village of Lexington on the eve of the American Revolution did not have a minute man company. Instead, the men from that town were enlisted in a single militia company known as "The Lexington Training Band".The band was commanded by Captain John Parker and was comprised of one lieutenant, two ensigns, three sergeants, four corporals, one clerk, one fifer, one drummer and one hundred and twenty-eight privates. The men not only hailed from Lexington, but the bordering towns of Woburn, Billerica, Menotomy and Lincoln as well. The term training band can be traced back to the reign of England’s Edward I, when parliament enacted legislation decreeing that every freeman between the ages of 15 and 60 years was to be available to preserve the peace within his own county or shire.2 In the towns where the units were organized and located, they were known by the virtue of their periodic training as "trained bands". However, when parliament, under the rule of Charles II, revised membership requirements, established pay and appointed officers, trained bands became known as militias. 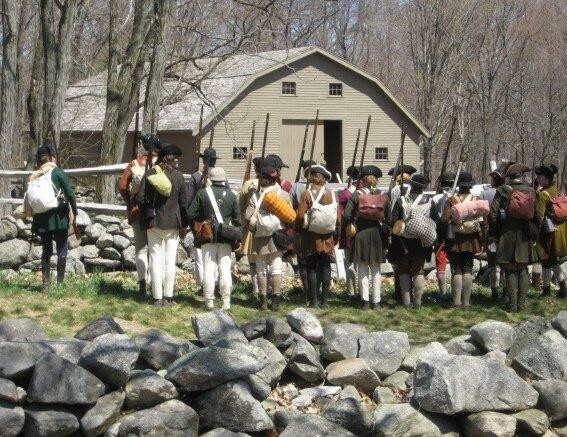 By the 17th century, the militia had become the cornerstone of English society and thus, when Plimoth and Massachusetts Bay Colonies were founded, the militia naturally followed. 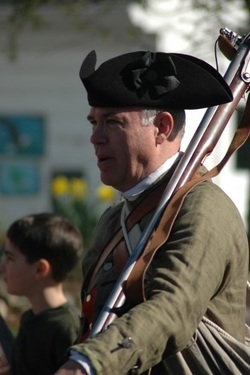 When Lexington established its militia, it retained the ancient English title of training band. Massachusetts militia companies, on the eve of the American Revolution, lacked a uniform supply of weapons and equipment. Everything the men possessed was their own property and thus, the typical militia, like the one before you today, had a varied assortment of accouterments and weapons. Often, men would turn with old, often outdated equipment issued to them during the French and Indian Wars. Some carried French made weapons obtained from the expeditions against Louisburg in 1745. Others would risk their lives by purchasing equipment from a willing British soldier. Seldom did two individuals in the same company possess the same type of cartridge box, bayonet, knapsack or canteen. The flintlock musket was the weapon of the era and according to the various drill manuals a soldier would follow thirteen separate motions to load and fire it. A well trained soldier could load and fire his musket four times in a minute, the standard required in many drills of the period. A British authority writing on the military muskets of the period indicated that it was an inaccurate weapon and only had an effective range of approximately eighty yards. Other problems with the musket included the poor quality of gun powder. Black powder used in muskets was an inefficient propellant and often fouled the bore of the barrel. Musket balls were often cast undersized and would bounce down the barrel when fired. On October 29, 1774 The Provincial Congress of Massachusetts had strongly suggested that each town reconstitute its militia company and that the citizens “perfect themselves in military skill.” Certainly this was an indication of the fear that open conflict was imminent. Lexington’s response was to replace the old officers of its militia company, choose John Parker as Captain and to drill more frequently. This is exactly what Benjamin Tidd and those who drilled with him in the evening of April 18, 1775 were doing. The Training Band demonstrates the methods of drill and maneuver utilized in the American Revolution. Infantry formations during the 18th century were governed by linear tactics. Personnel were marched to the combat area in columns consisting of two or more files of men. However, once on the battlefield, the troops were deployed into ranks, each facing towards the front with the men standing shoulder to shoulder, to form a line of battle. Troops overcame terrain problems, such as trees, rocks and narrowing paths by executing various movements, such as wheeling, having sections split or break off into separate units or oblique marching. Through these executions, soldiers could march around or through any given obstacle. The purpose of drilling was to compensate for the limitations of the inaccurate muskets of the time. Men were concentrated in close ranks, shoulder to shoulder, to fire in unison and only upon command and to reload as rapidly as possible. With bayonets fixed, the attacking force would advance to the beat of a drum until they reached a point of eighty yards away from their enemy. After a volley, the force would advance to fifty yards. A second and perhaps a third volley would be fired. At the moment of impact, the attacking force turned to the bayonet. In this manner of warfare, rate of fire became more valuable than accuracy; speed and precision had to be combined with iron discipline, factors necessary for the soldiers to continue loading and firing despite casualties around them. A related benefit of the extensive drilling was to foster the soldiers’ confidence and discipline, which could be vital in the noise, smoke and confusion of battle.8 Men were marched to the field in columns and then deployed into long lines of two or three ranks. This formation permitted the concentrated and continuous firepower that maximized the effectiveness of the musket, at its best resulting in sheets of lead balls that had the greatest chance of lethal effectiveness against the opposing ranks. As has been described elsewhere on this site the obligation of citizens to bear arms came to us from England. The concept was formalized at least by the twelfth century when King Henry II required all freemen to possess certain arms for defense. King Henry III then made it obligatory for every subject between the ages of fifteen and fifty to own a weapon other than just a knife. By the Elizabethan period the militia laws were codified to require a certain proportion of the male population to train at regularly established times under the supervision of the Lords Lieutenants. The term “Train Band” or “Training Band” then came into popular use to describe such militiamen.